Warm up the engine to full operating temperature. Release the fuel pressure. Refer to EC-144, "Work Procedure". Remove the ignition coil and spark plug from each cylinder. Refer to EM-36, "Removal and Installation" and EM-17, "Removal and Installation". Connect engine tachometer (not required in use of CONSULT). Disconnect the fuel injector harness connector to avoid any residual fuel injection during the measurement. Install the compression tester with the adapter into the spark plug hole. 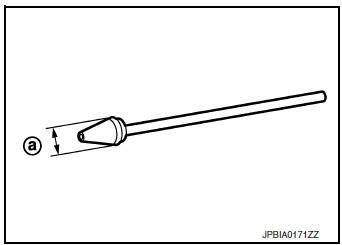 Use compression tester whose end (a) (rubber portion) is smaller than 20 mm (0.79 in) in diameter. Otherwise, it may be caught by cylinder head during removal. With the accelerator pedal fully depressed, turn the ignition switch to the “START” position to crank over the engine. When the gauge pointer stabilizes, read the compression pressure and engine rpm. Perform these steps to check each cylinder. CAUTION: Always use a fully charged battery to obtain specified engine cranking speed. If the engine speed is out of specified rpm range, check the battery. Check engine speed again with a fully charged battery. If compression pressure is below minimum value, check valve clearances and parts associated with combustion chamber (valve, valve seat, piston, piston ring, cylinder bore, cylinder head, cylinder head gasket). After the checking, measure compression pressure again. If some cylinders have low compression pressure, pour small amount of engine oil into the spark plug hole of the cylinder to re-check it for compression. If the added engine oil improves the compression, the piston rings may be worn or damaged. Check the piston rings and replace if necessary. 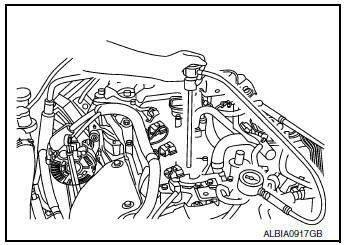 If the compression pressure remains at low level despite the addition of engine oil, the valves may be malfunctioning. Check the valves for damage. Replace the valve or valve seat accordingly. If two adjacent cylinders have respectively low compression pressure and their compression remains low even after the addition of engine oil, the head gasket is leaking. In such a case, replace the cylinder head gasket. Install spark plug, ignition coil and harness connectors. Refer to EM-17, "Removal and Installation".